In 24 hours time we will know whether or not a CCL side has made it to the Buildbase FA Vase Final. It’s Chertsey Town, of course, and one would hope they have done the hard work with their 1-1 draw up at Northwich last Sunday. 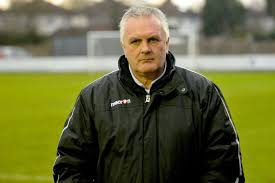 It is all to play for though and the League sends its very best wishes to manager Dave Anderson (pictured) and his team. Although Guernsey came mighty close, if Chertsey make it, they will be the first CCL club since Epsom & Ewell to reach the Final and that was when the League was still known as the Surrey Senior League. Current members Southall also made it to Wembley but they were not with us at the time. There is a slightly reduced programme in the Premier Division on Saturday as this date was originally kept largely free for re-arranged matches but there are still 7 games on, the pick of them possibly being the relegation dog fight between Walton & Hersham and Hanworth Villa. After something of a revival the Swans have rather slumped again, with three successive defeats. Hanworth Villa though have suddenly found some form just at the right time it seems, with a 4-0 win last Saturday over Redhill being followed by an even better 5-0 win against AFC Hayes in midweek. There are some interesting matches in Division One, the pick possibly being Tooting Bec playing at home to Epsom & Ewell. Bec surrendered their long unbeaten run on Tuesday, losing at Frimley in the quarter finals of the Esoteric Division One Challenge Cup match, whilst Epsom have seen their hopes of promotion straight back to the Premier Division taking something of a nose dive in recent weeks. The League’s senior cup finals are now arranged. The Cherry Red Records Premier Challenge Cup Final will be at Windsor F.C. on Saturday 11 May, kick-off 3.00 p.m. whilst the Esoteric Recordings Division One Challenge Cup Final will be at Meadowbank, home of both Surrey County FA and Dorking Wanderers on Bank Holiday Monday, 6 May, kick-off 3.00 p.m. Youth Secretary Paul Blair is arranging the U23 Development Cup Final and the two Youth Cup Finals and he will be interested to hear from any clubs who would like to stage a Final.